Welcome emails are one of the most important communications you’ll ever send to your recipients. Why? Because your welcome email is likely the first time you’re in their inbox. You have to make it count! My favorite store is back in my home state of New Jersey. Every time I walk in, I’m greeted at the door by one of the friendly, smiling owners who thanks me for coming in and asks me if I’d like a complimentary glass of champagne. She then leaves me to browse the shop at my own pace, while assuring me that she’s close by if I need any assistance. New items are always strategically placed in front of the store, so I can’t miss them and a very hip Spotify playlist subtly streams in the background. The shop is unintimidating, easy to navigate, and welcoming. Why am I telling you this? Because your welcome email should provide this exact same experience. While it doesn’t need to be accompanied by a free glass of bubbly (but how amazing would that be?? ), it should be friendly, instructive, and timely. Just like my favorite store has me coming back time and again, your welcome email is your shot to win your subscriber’s loyalty. So let’s take a look at some welcome emails that are hitting all the right notes in encouraging their subscribers and earning their trust. 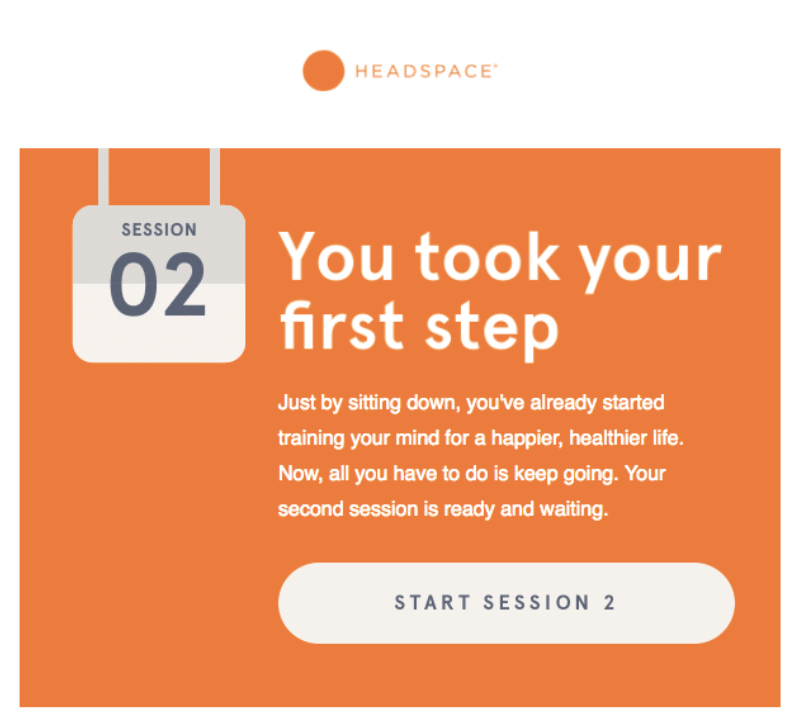 Headspace excels at all 3 of the “musts” for a great welcome email, shared above. First, the tone of the email is congratulatory and inviting. The design is warm and perfectly mimics their website and the email is short and sweet. (Pro tip: making your website/email experience continuous is a great way to increase loyalty and brand affinity.) This welcome email is easy to navigate and gets me right into their content. Note that their primary CTA, “Start Meditating” isn’t cluttered by other links or distractions. In fact, there are no other hyperlinks in the email to distract me from getting started. Pro tip: Don’t distract your new subscribers with too many asks. Stick to one CTA when possible. 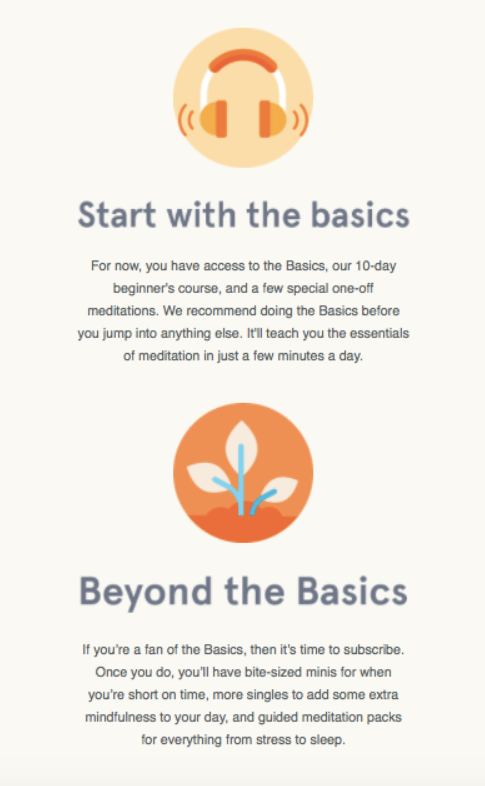 Headspace’s welcome email also clearly explains how to get started. It answers my questions before I even have them. 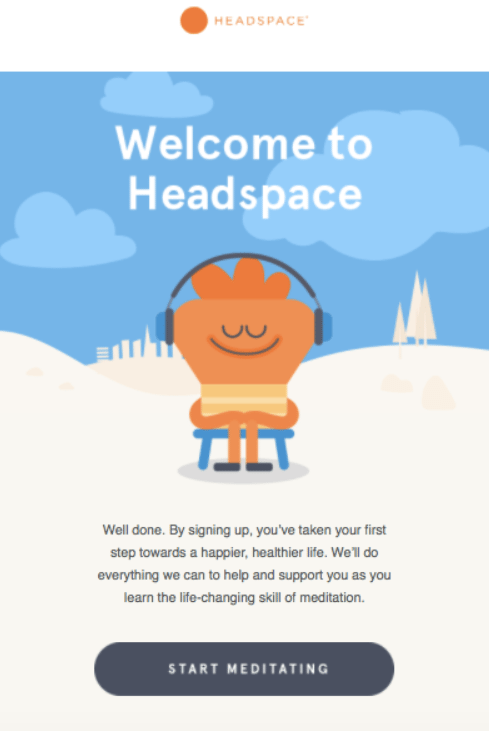 Use your welcome emails to reduce sign-up anxiety for your users by following Headspace’s lead and giving your users easy instructions on how to get started. The day after I received their welcome email and engaged with their app, I received a triggered second email that followed up on the action I took the day before. It’s similarly encouraging and straightforward with the singular CTA. I felt immediately supported by their attention to my engagement and it helped me get right back into their app. Now, let’s take a look at interior design app, Havenly. 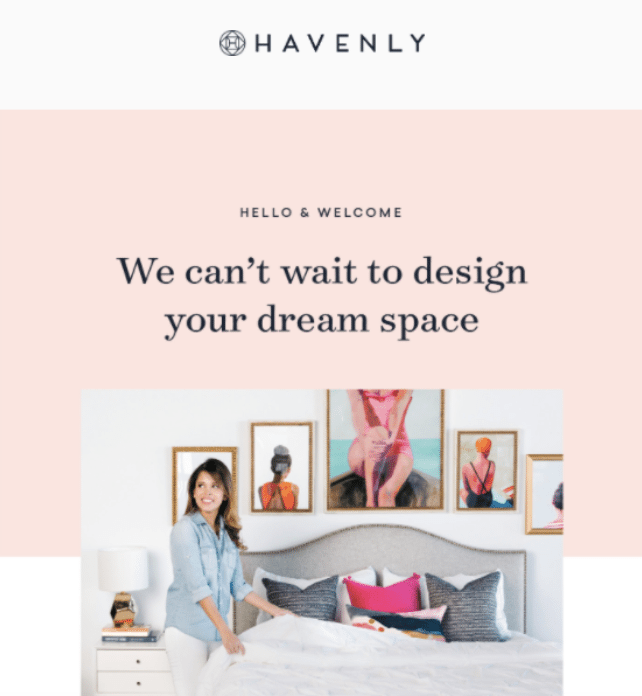 As a design company, I guess I shouldn’t be surprised that Havenly’s welcome email design is perfection! It has a balanced image to text ratio and their template is inviting and perfectly mirrors their site design. Just like my favorite store, mentioned above, your welcome email should be a sensory experience—visually appealing and consistent with your brand. Your themes, fonts, and tone should all resemble your website or product/service. Havenly nails that here. 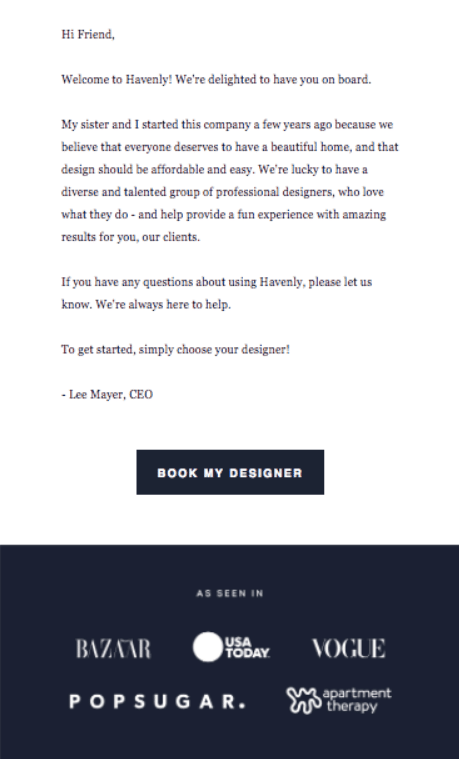 Here, Havenly’s CEO, Lee, also shares a simple directive for how to get started: choose a designer. This simple CTA doesn’t overwhelm users and helps gets them to engage quickly. Finally, Havenly is a great example of the perfect welcome email as they build trust with their new subscribers by including news coverage by recognizable brands above their footer. There’s no harm in showing your users why they should be glad they chose you. Two other great examples of great brands that get their recipients straight into their service with effective welcome emails are Nextdoor and Penguin Random House, below. 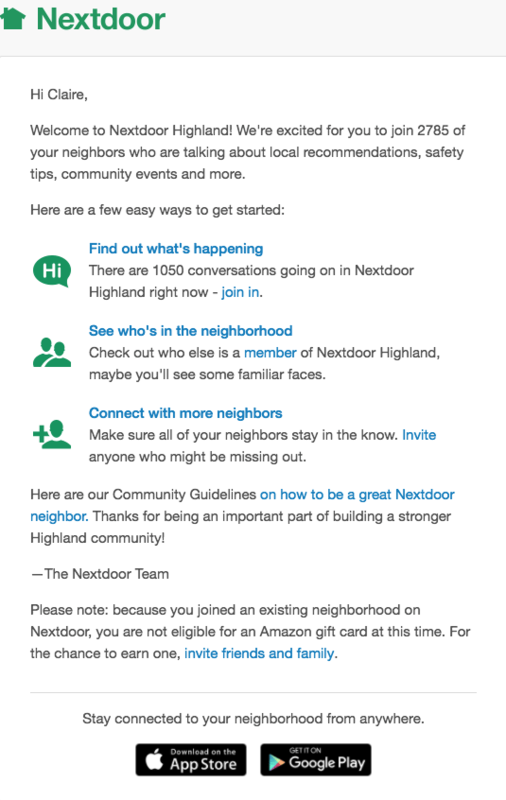 Nextdoor takes a simple, instructive, but effective approach to their welcome email. They outline 3, easy ways to get started in their app. Limited scroll works in their favor here, so even though they have 3 CTAs, I don’t feel too overwhelmed by my choices. Penguin Random House is similarly effective with their welcome email. They jump right in by providing immediate value—in the form of awesome book recommendations. (Pro tip: Don’t bury the lead of your welcome email with too much exposition. Jump right in and provide value in the form of information or discounts.) This approach is also a great way to collect data from users who have yet to shop with them. By giving me lots of books to choose from, Penguin Random House learns what my interests are based on my clicking history. I also love their intriguing subject line “You’re gonna need a bigger bookshelf…” Encouraging and funny. Keep your welcome emails on brand and a direct reflection of your website. Be inviting and encouraging with your recipients! Let them know you’re happy to be in their inbox. Limit your scroll and get to the point quickly. Share value fast and stick to one CTA when possible. Get your subscribers invested by sharing a bit of your brand’s history. 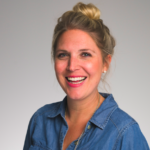 Build connection early to keep them coming back and to create brand advocacy. Images aren’t always the answer! If your copy is strong, don’t distract from it with unnecessary images. Don’t bury the lead of your welcome email with too much exposition. Jump right in and provide value in the form of information or discounts. Welcome emails are a great type of email campaign to automate. If you’re interested in learning how to send automated welcome emails with SendGrid, sign up for early access to our email automation beta! Lastly, have fun with your welcome emails! Put your best foot forward and test new concepts to keep your new subscribers engaged and interested. If you’re interested in learning how pull your welcome email into your larger email marketing strategy, check out our 2018 A-Z of Email Marketing Guide.